Brian has almost 40 years experience. His piping heritage is impeccable, his pedigree tracing back to legendary pipers John MacDonald and Pipe Major William Ross. 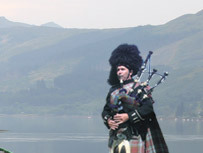 Brian has long taken an academic interest in the history of the bagpipe, its music and its people. Originally, piping was taught in an aural tradition, with tutors singing the tunes to their pupils. Staff notation and other so-called “scientific methods” are a relatively recent phenomenon and even now, not all pipers can read music. 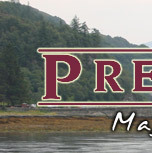 Brian’s chief musical passion is the traditional pibroch. However, he has been taught music theory to a level far higher than most pipers. It is this theoretical insight that characterises Brian’s teaching and complements his teaching of practical skills. Contact us to discuss your specific tuition needs. Don’t worry about getting hold of a full set of pipes. As a beginner, you will learn using a practice chanter, an instrument that will probably remain with you the rest of your life. If you wish to buy you own chanter, we are happy to recommend a suitable instrument. Talking to an expert is strongly advised. 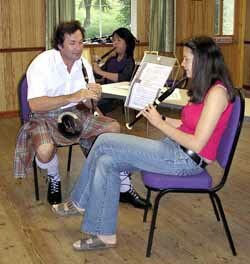 One-to-one teaching is available for either solo pipers or for band members who can’t get individual attention during regular band practice.